This is an easy tasty recipe from Taste. I made the mixture in the early afternoon and then cooked the meatballs for dinner. I used a 1″ scoop and they were the perfect size. David enjoyed them with pasta and I had them on bibb lettuce with fresh tomatoes. Preheat an oven to 350°F (180°C). Lightly oil a baking sheet. In a bowl, combine the chicken, panko, soy sauce, fish sauce, lemongrass, cornstarch, cilantro, ginger, and garlic. Season with salt and pepper and mix well. Roll into 1-inch (2.5-cm) balls. Warm a large sauté pan or frying pan over medium heat. Add the 1⁄4 cup (2 fl. oz./60 ml) oil and heat until it appears to shimmer. Add the meatballs and sauté, turning the meatballs to brown evenly on all sides, about 5 minutes total. Drain on paper towels. 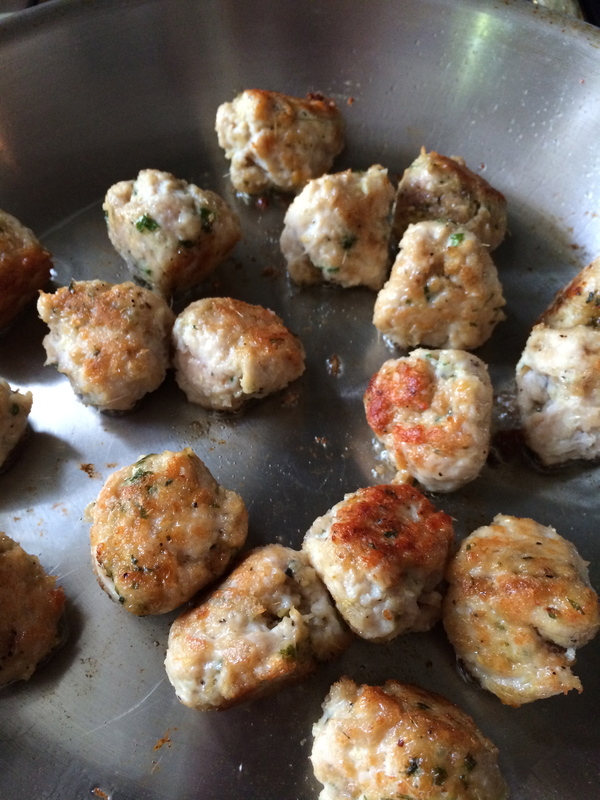 Transfer the meatballs to the prepared baking sheet and bake until cooked through, 3 to 5 minutes. Arrange the lettuce, green onions, and limes on a platter. Serve the meatballs in a bowl on the side. Instruct guests to place a meatball in a lettuce leaf, top with green onions, squeeze with lime juice, fold and eat. Serves 3 to 4.